New Delhi : Indian multinational automotive manufacturing company Tata Motors Limited, has launched a new variant of its SUV Safari Storme with a more powerful heart, Powered by a new 2.2L Varicor 400 engine, Safari Storme VX is priced at Rs 13.25 lakh for 4X2 option, and Rs 14.59 lakh for the 4X4 option (ex showroom Delhi). The Storme will be available with the VX variant with both - 4x2 and 4x4 options. The 4-wheel drive version can be engaged on-the-go with its ESOF (electronic shift-on-fly) feature and the SUV is also fitted with a limited slip differential. The Storme VX also boasts of features such as the new infotainment system with 6-speakers by Harman. It gets Bluetooth, CD, MP3, USB, Aux-in and i-Pod connectivity, audio streaming and a reverse parking sensor display. This SUV is available in 5 colours - Arctic Silver, Urban Bronze, Pearl White, Astern Black and Arctic White. 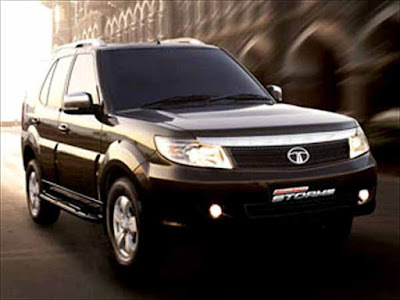 3 year or 1,00,000 km warranty is standard on the Storme (extendable upto 4 years or 1,50,000 kms). Commenting on the launch, Mayank Pareek, President - Passenger Vehicle Business Unit, Tata Motors, said, "With a massive road presence, along with superior on-road and off-road capabilities, the new VX variant of the Safari Storme with Tata Motors new VARICOR 400 engine and a new 6-speed gear box, will further exemplify the excitement and performance quotient of India's most popular SUV".